Rexing Dash cameras have become increasingly popular in recent years as ways of preventing insurance fraud or escaping blame in a traffic incident. Often when an accident occurs, and there are no witnesses, the investigation degrades into a game of “he said, she said.” But with a Rexing dash camera recording every incident on the road in front of you, you can give law enforcement, and insurance companies access to incontrovertible footage that could bring any disagreement to a quick resolution. Rexing Dash cameras are one of the more popular brands that can be found on the market today. The cameras are moderately priced and typically built for stealth. There are some good options by the Rexing brand online and elsewhere, but to make matters easy for you we’ve gone ahead and put together our list of best Rexing dash cameras. On our list of best Rexing dash cams, you’ll be sure to find one that meets your needs and doesn’t break your wallet. The Rexing V1 is a discreet, wedge-shaped dash camera that can be positioned anywhere on your windshield. Because of its unusual design, it’s unlikely that other drivers or someone passing by would even recognize the Rexing V1 as a dash cam. The benefit of this is that it will less likely be stolen and that it does not become an eyesore for passengers in your vehicle. The Rexing V1 films in full 1080P and is known for its superior video quality. The WDR technology in the Rexing V1 automatically adjusts the lens exposure of the camera to get the best picture, no matter the lighting conditions. The lens is made of 6 glass layers and is fish-eyed to capture a full 170 degrees of whatever is in front of it. G-sensor technology automatically locks any files recorded during a moment of unusual vibration. The Rexing S300 is an alternative to the V1 listed above. It’s shape is not wedge-like but rather more like a handheld gaming console which can be hidden behind the rearview mirror and affixed to the windshield via an adhesive mounting pad. This means that the camera stays out of view while you drive and doesn’t prove to be a distraction to other people in the vehicle. 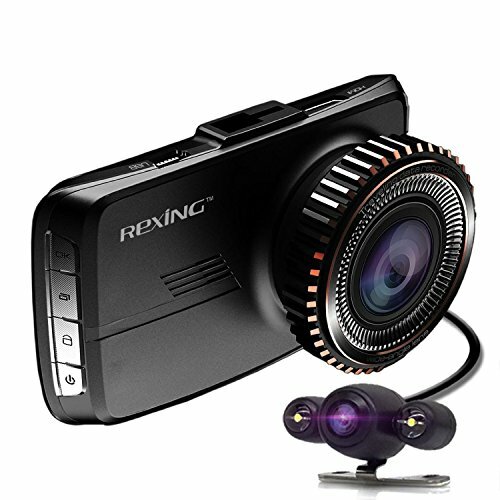 The Rexing S300 films in 1080P and can capture super wide footage of the road in front, up to 170 degrees. The Rexing S300 also boasts superior night vision capability and a G-sensor which locks footage filmed during unusual vibrations so that you never lose video of an important incident. Can also function well in extreme temperatures. 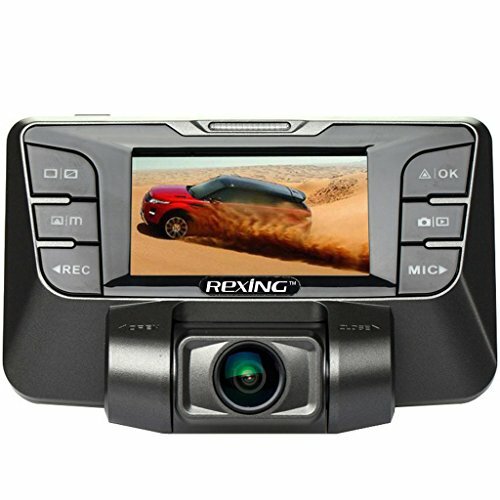 The Rexing HD18 is an example of a dual channel Rexing dash camera. The Rexing HD18 comes with a front facing camera that looks like a point and clicks camera and a back facing camera that looks like a little cube. The front facing camera of the Rexing HD18 films in 720P and the back facing cube camera films in 480P. While the video quality for these dash cameras is not as high as some of the other Rexing cameras out there, the quality is still good enough to record important features like street signs and license plates. A visual reverse function shows a picture of whatever the back-facing camera sees whenever the car is moving backward. The Rexing V1N is another wedge-shaped camera by Rexing at a slightly higher price. The V1N promises superior night vision capability and a powerful WDR that allows the camera to perform optimally in low-lit situations. The 6-layer glass lens of the Rexing V1N can withstand extreme temperatures making it an ideal camera for those living in exceptionally warm climates. The Rexing V1N has been tested as being able to work at 140 degreesF and can be stored at temperatures up to 160 degrees F.
The Rexing V1N also comes with a G-sensor that will lock your most important recordings so even as the loop recording function kicks in, files that were taken during unusual vibrations will not be written over. With automatic recording every time the car starts, the beautiful thing about this camera is that you can set it and forget about it. The Rexing S500 appears to be a powerful hybrid of the Rexing V1 and the Rexing S300. It is the most expensive Rexing dash camera on our list and for a good reason. The Rexing S500 is a dual channel dash camera whose two cameras are both easily rotatable. Both cameras film in wide angle also and can be repositioned within the vehicle, however, the driver likes. The front facing camera of the Rexing S500 films in 1080P, while the rear facing camera films in 720 P.
The Rexing S500 comes with superior night vision capabilities and WDR technology, which automatically adjusts the lens to let in more or less light. This means you get a clear picture each time you drive. Enhanced HDR technology also means that the glare from strong headlights is reduced significantly. 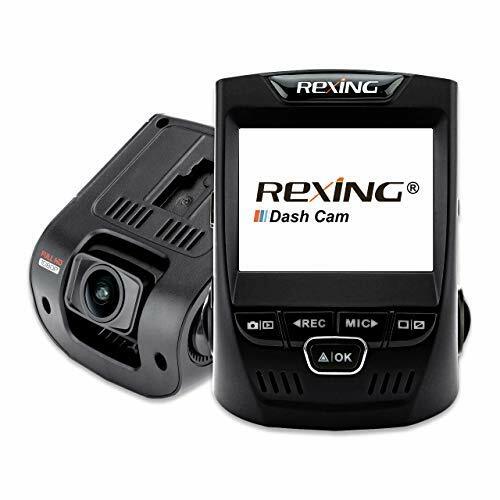 Rexing is one of the industry leaders regarding discreet, high-powered dash cams. They are one of the pricier brands, but the reviews online and elsewhere seem to confirm that the cost is worth it. Rexing camera bodies are typically known for their stealthy bodies – wedge-shaped or console-like devices that hide up and away from sight behind your rear view mirror. 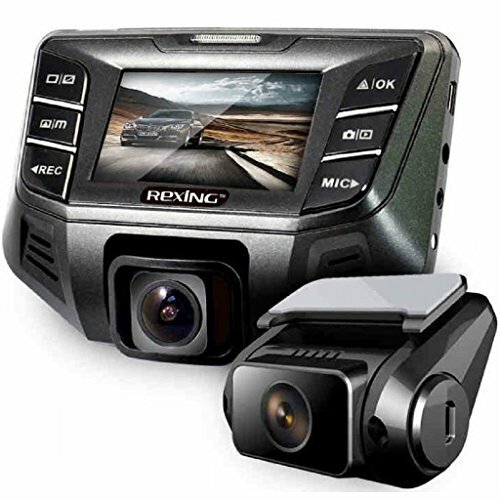 With automatic recording, chances are you’ll forget your Rexing dash cam is even there until you need it.The Rexing cameras also seem to have a certain satisfying bulk to them when compared to flimsy, plastic models of other competitors. All in all, it would be a smart move for any consumer to purchase a Rexing dash cam. With a wide range of camera styles and price points, someone in the market for a dash camera would be able to find a great option that aligns with their specific needs. Whether you are looking fro a dual channel camera that films the front and back of the car at the same time, or a simple point and click style camera that will deliver HD quality footage in one direction. We hope you were able to locate a device that will give you the peace of mind you crave while setting out on the road.